Revolutions lead to dictatorship, and are 'a bad thing'. 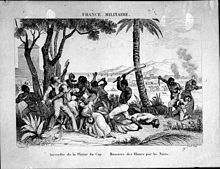 What about the The Haitian Revolution of 1791–1804? We've been to Haiti and it still looks like a slave colony. In Haiti, the French slave owners produced many mixed-race children. These children were given an education and helped run the French colony. They became the elite after the revolution. 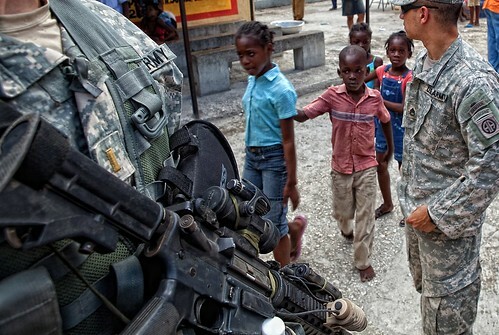 After the revolution, the 'black' Haitians continued to be treated like slaves. 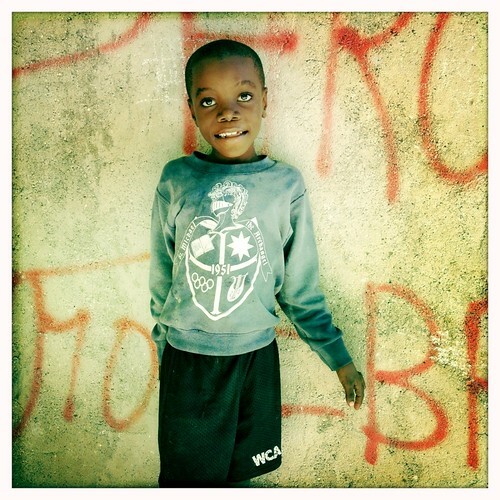 Today in Haiti, at least 300,000 children live as slaves - in forced and usually violent servitude. It was on 1 January 1804, that Jean-Jacques Dessalines declared Haiti to be 'free and independent'. This was followed by the massacre of the remaining whites. Dessalines' secretary stated, "For our declaration of independence, we should have the skin of a white man for parchment, his skull for an inkwell, his blood for ink, and a bayonet for a pen!" Haiti was the first independent nation in Latin America and the first post-colonial independent black-led nation in the world. As a result of the revolution, Haiti was crippled. It owed money to the bankers. The revolution had devastated agriculture. Haiti had to pay millions of francs in reparations to the former French slaveholders. Haiti's revolution got rid of slavery? Haiti's revolution ended in 1804. But, in 1794 the French Convention had already abolished slavery. Haiti benefited from its revolution? After the revolution in Haiti, approximately 90% of Haitians were in "wage earning serfdom" - earning so little on the planatations that they were more or less slaves. 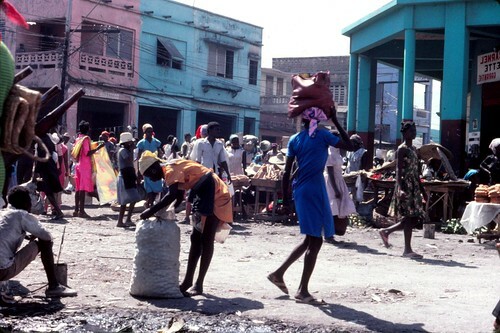 How does the Haitian economy work? Reportedly, most baseballs are made in Haiti and they are made by American companies. The factory girls get 'starvation wages'. Reportedly they also get injured arms and eyes. In Haiti, the Americans control the bauxite, sugar and sisal. It's like Cuba before Castro. Franz gave his old battered plimsoles, which were split on both sides, to a tiny barefoot beggar boy with a badly swollen eye. The plimsoles were many sizes too big for the tiny beggar, but, the boy was overjoyed to have them and thanked us many times. Minoir shuffled away, going round to the back of a restaurant to search for food. A fat lady came running out of the restaurant and started chasing Minoir while brandishing a piece of rope. Minoir ran down the street screaming. The fat lady picked up the plimsoles and threw them in a rubbish bin. Sitting in the park in front of the president's palace eating lunch, Franz and I were stared at by a boy with legs as thin as pokers. I offered him a roll. He thanked us so very politely and ran off to eat it hurriedly behind a tree. Revolutions have always been part of the Hegelian Dialect, lets be honest, ordinary people are too busy trying to survive daily life to revolt (or watching sprot or junk tv). Revolutions take money, they take publicising and they take leadership-of the variety that doesnt get bumped off by the establishment before they can lead an insurection. Great job, Aang. Thanks a lot. But, author of this film, Maziar Bahari, made many mistakes: f.e. Ahmadinejad never said "this regime (Israel) needs to be wiped off the pages of history" ,etc. Maziar Bahari, a London based, Iranian-Canadian journalist, received full funding from the BBC to make his documentary An Iranian Odyssey: Mossadegh, Oil, and the 1953 CIA Coup, and claims to have culled material from “about 100 different sources” and “at least 10 different countries”. This wasn't obvious to me, yet I did notice numerous factual inaccuracies and omissions, some of which I will address here. Iranian-born Canadian journalist Maziar Bahari has acknowledged for the first time that his interview with Iran's English-language Press TV was conducted through his own free will. Bahari had previously claimed that his interview with Press TV was conducted without his consent. “I said 'OK, come and interview me,'” Bahari said in an interview with the state-run BBC Persian channel. On July 1, 2009, Press TV reported on an armed attack on a Basij military base in the Iranian capital, Tehran. Major state-sponsored British media outlets such as the British Broadcasting Corporations (BBC) and Channel 4 aired the manipulated footage that showed what appeared to be an incident of unrest near Tehran's Azadi Square, during which a number of Basij forces were shown shooting at what was claimed by the British media to be 'peaceful protesters,' although it was evidently not clear who and what the targets were. Press TV later aired a more detailed version of the same event that clearly showed images of rioters attacking a Basij military base with stones and petrol bombs, while the guards were making great efforts to defuse the situation and prevent assailants from accessing the base's arms cache, which contained hundreds of weapons. The longer footage clearly showed that the previous reporting by the state-run BBC and Channel 4 had been biased and distorted as they did not show the attacks on the military base which provoked its guards to react. Meanwhile, the UK government has launched a smear campaign against Iran's Press TV. The latest effort against Press TV is led by the London-based Office of Communications (Ofcom), and hovers around allegations leveled against the Iranian news channel by Bahari. Bahari has thus become an instrument in the hands of the British government to hatch a plot that has been implemented by its subordinate media arms, including Ofcom, as well as newspapers such as The Guardian, The Sunday Times, and The Daily Telegraph to undermine the surging influence of Press TV network. An illegal move by the Eutelsat media company to ban Iranian TV channels aims at silencing alternate news providers and opposes free speech supported by the EU Commission. This decision is essentially one passed down from Tel Aviv through surrogates inside Europe and Eutelsat … there are many providers that could have blocked Press TV; Eutelsat in particular is a Mossad operation, has always been a Mossad propaganda operation."